Looking for a few trim pieces to finish up the '55 we're working on. Hoping to find some nice ones. Located a few qtr. trim pieces. Still one the hunt for the driver side interior door panel trim. I don’t know if he is still in business, but I’ve had good luck with Norbert Doll out of Oklahoma in the past. He specializes in mid-fifties Fords. 405-372-6606. Thank you. Cool lookin' wagon. If you can provide a BODY SERIES CODE, BODY TRIM CODE and INTERIOR TRIM CODE, I will try and find the interior trim panel mldg PN. Should make the search easier. 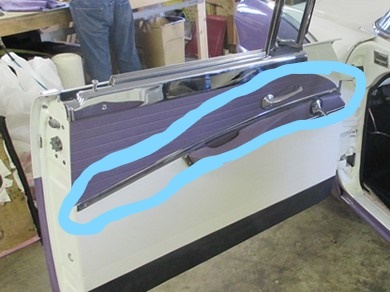 That interior door trim piece doesn't look like a '55 Victoria, it must be a custom piece. 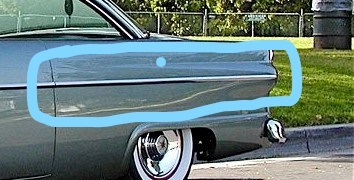 EDIT: I looked at a couple of CROWN Vic ads and it looks like the interior door trim is from a Crown Vic. Yes, Crown Vic. I have all the other trim. Just needing these pieces.